Born in Brisbane to a Minister father and a talented musician mother, Jasmine Mansbridge moved frequently during her childhood living in different States until settling in Katherine – the Northern Territory. This could very well be the reason why Jasmine’s work is so structured, clean and orderly – a response to the experiences she had during her childhood (maybe a little chaotic at times), the people she met and the places she visited. 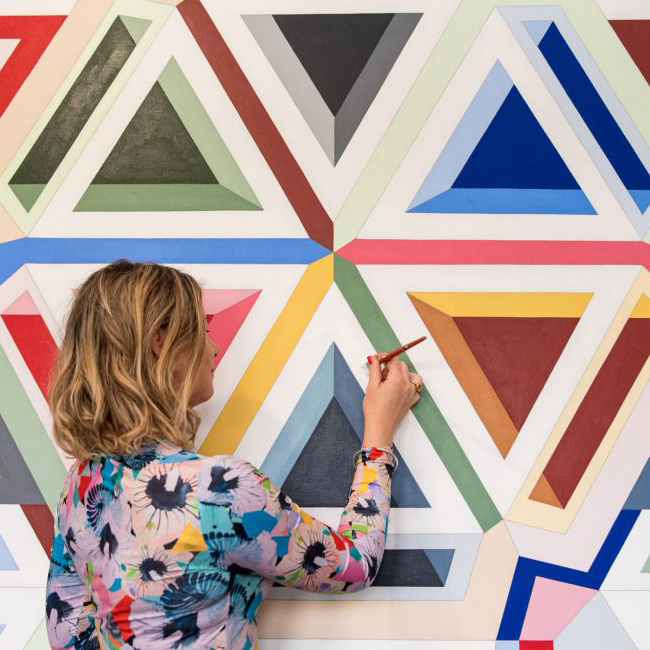 Her Geometric Contemporary paintings are bright and colourful, full of energy – a testament to her involvement with indigenous communities and the unique landscape she lived amongst. Jasmine has participated in many group and solo shows and has also worked on large scale wall murals including Royal Stacks Stores in Chatswood, Melbourne and Beijing and The Roxburgh Cafe. I was born in Brisbane, QLD. My father was a minister and a teacher and my mother a talented musician. My family moved frequently during my early childhood. These moves spanned across several states of Australia. Eventually we settled in Katherine, in the Northern Territory and it was there I spent my formative teen and early adult years, staying there even after my parents divorced and relocated. The twelve years that I lived in the Northern Territory had a big influence on my creative life. It was there that I began painting seriously. I was involved with an Aboriginal Art Gallery and developed friendships with several indigenous artists. These experiences along with the unique landscape and my own challenging life circumstances in the Northern Territory, had quite an impact on the content and the visual component of my early work. I left Katherine in 2005 and after living in NSW for a time, I settled with my husband and (now) five children in Regional Victoria. In addition to my studio painting, I am working more and more on a larger scale, painting murals and developing ideas for installation pieces. I aim to further my skills in these areas and therefore over time, expand my creative scope. and I have had eight solo exhibitions, with the exhibitions planned in Hong Kong and Melbourne in 2018.